A routine win sees the Courage stay on top of the NWSL while the Spirit continue to struggle for goals. North Carolina Courage: Rowland; Mathias; Dahlkemper, Erceg, O'Reilly; Dunn (Hamilton, min. 71), O'Sullivan, Zerboni, Debinha (Speck, min. 88); McDonald (Mewis, min. 65), Williams. Washington Spirit: Bledsoe; Smith (Eubanks, min. 85), Johnson, Church, Dydasco; Sullivan, Quinn, Huster, Dougherty Howard (Solaun, min. 73); Hatch, Banini (Lavelle, min, 73). SCORE: 1-0, min. 10, Debinha. 2-0, min. 60, McDonald. REFEREE: Daniel Gutierrez (USA). Yellow Card: O'Sullivan (min. 53). 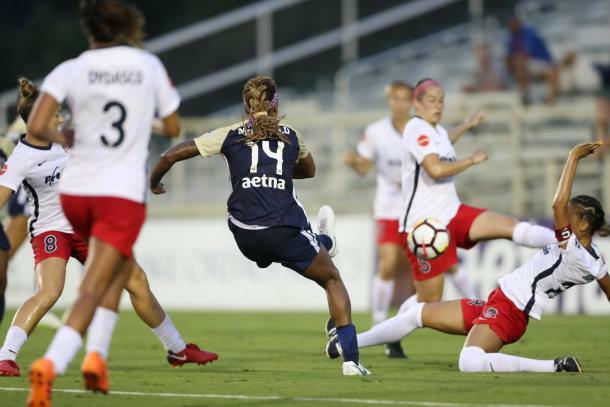 Pre-match predictions were not dispelled as the North Carolina Courage picked up an easy win against a struggling Washington Spirit side. 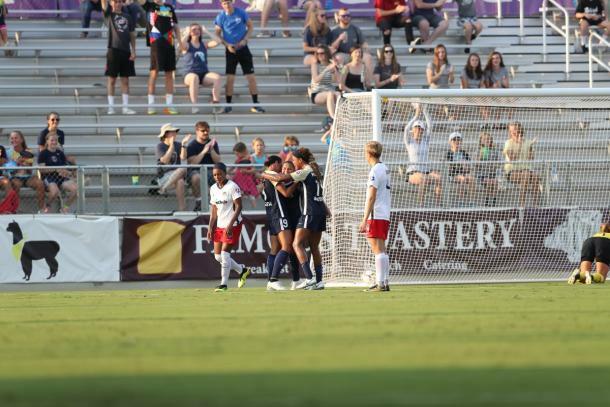 Goals by Debinha and Jessica McDonald keep the Courage sixteen points ahead of the chasing pack (for now) while also relegating the Spirit to their fourth consecutive loss. Washington stayed back for the majority of the match, fearing what the Courage could do on the break if they lost the ball to them. The tactic wasn't a bad idea it only lasted for 12 minutes. With the Spirit backline still shifting as North Carolina moved the ball around, Denise O'Sullivan found Lynn Williams out wide on the flank and Williams then elected to pass instead of shooting. Her ball across the box was deflected into Debinha's path and the Brazilian made sure of her finish, giving her six goals so far this season. The Courage continued to look for goals and Crystal Dunn had a few chances to add to the scoreline but Aubrey Bledsoe was on hand to make a couple of crucial saves for Washington. This would become a theme throughout the match and Washington will leave North Carolina grateful to Bledsoe for the score only being two-nil in the end. 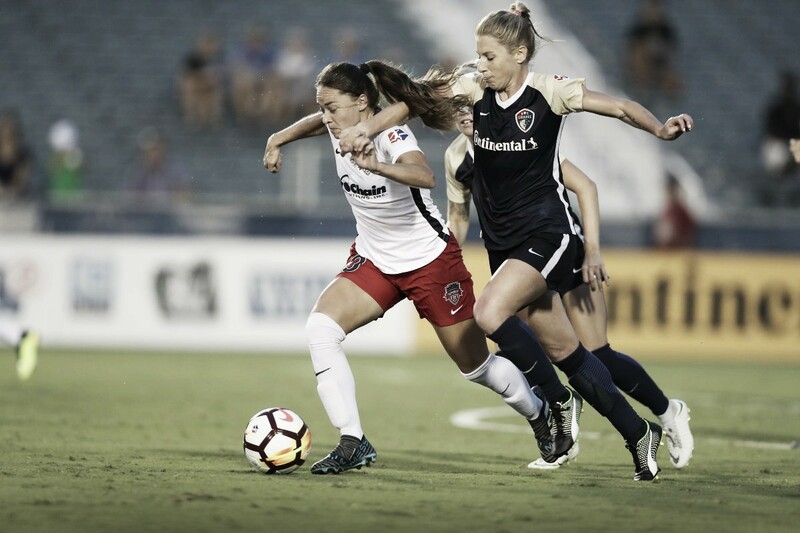 Bledsoe was constantly tested by the Courage forward line and with Heather O'Reilly, making her debut for North Carolina, and Merritt Mathias providing great service, the Spirit were on the back foot. The Courage dominated possession and were content to play the game in second gear but still create chances if the opportunity fell to them. Bledsoe and Williams battled on two separate occasions with the Spirit goalkeeper coming out on top but she was powerless to stop Jessica McDonald's 60th minute goal. Washington gave the ball away in midfield to Dunn who carried it forward before playing it to McDonald. McDonald cut inside onto her left foot and then looped the ball beautifully over Bledsoe to secure the three points.